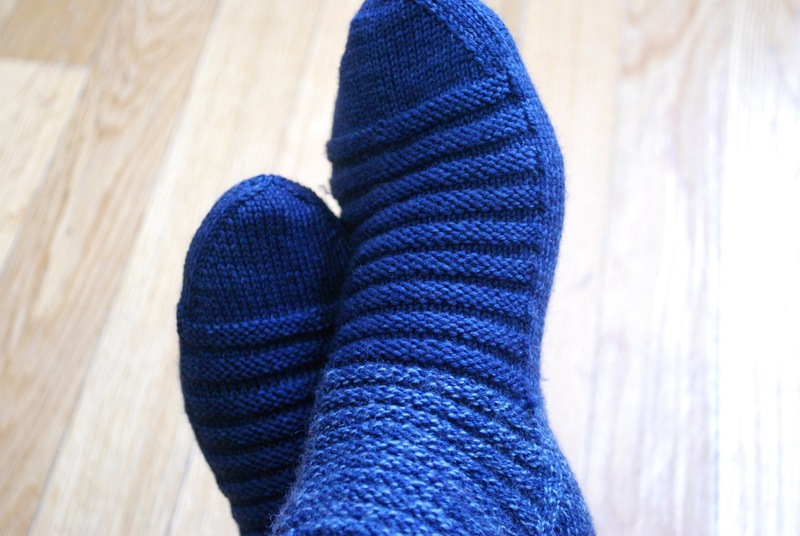 Winter has taken its toll on my handknit socks, and my collection is looking a little depleted. Two different pairs both had a sock go missing. 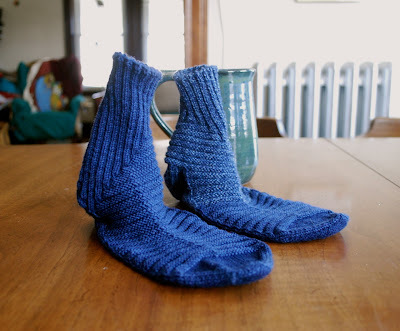 I imagine the AWOL socks having an affair somewhere, so I paired up the orphans so they wouldn't be lonely. Another pair was so full of holes that I finally had to toss it. It was time for me to crank out a new pair of socks. Treppenviertel. Socks that stand on their own. These socks remind me of some sort of underwater footgear. They may look odd, but they fit like a dream. 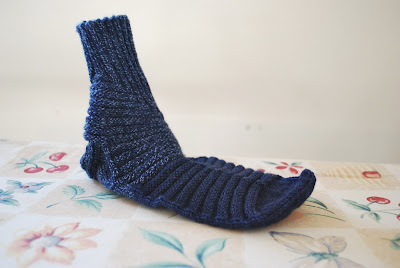 Vertical ribbing down the leg combined with horizontal ribbing across the foot makes an elastic sock that hugs the foot. The fabric is cushy, comfortable and cozy. Yes, the leg of the left sock appears to be more heavily variegated. I used a skein of yarn destined for the seconds pile. I'm sure it won't affect the wear, and I was happy to put the yarn to good use. Dirty Water DyeWorks Lucia, colorway Dusk. 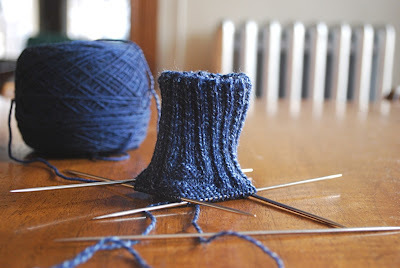 And now I have to cast on another sock project. I'm trying to stay ahead of the game. I always have high hopes for my weekends - an opportunity for focused, productive time. Every weekend I plan to move mountains, and this past weekend was no exception. My list included paperwork, calendar updates, taxes, taming my inbox. Just so I wouldn't be buried by that mountain I also planned for some fun - experiment with new colors, select new booth sample, dye yarn for said sample and cast on. It's Monday morning. The mountain is still here, but I made a dent in it. As for the fun . . . it's rolling over into today. I think I'll leave the mountain alone and cast on instead. 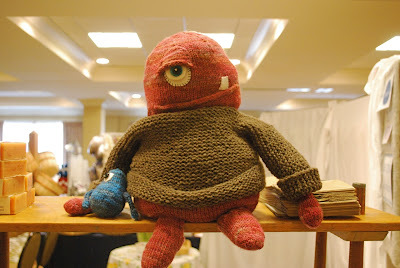 I have some wonderful knitting friends. They offer to help with everything from knitting samples to updating my newsletter list. And they make pattern suggestions. One friend recently recommended a cute, quick scarf project. She was on a roll with this pattern and had made several fun, colorful scarves that didn't take much time or yarn. What's not to love? I tucked away the pattern idea for future reference. Yesterday I had a meeting - an opportunity for knitting time. The only requirement was that the meeting project had to be small and mindless. None of my current projects fit the bill, so I started thinking of other options. I remembered the cute, little scarf and looked up the details. Perfect. 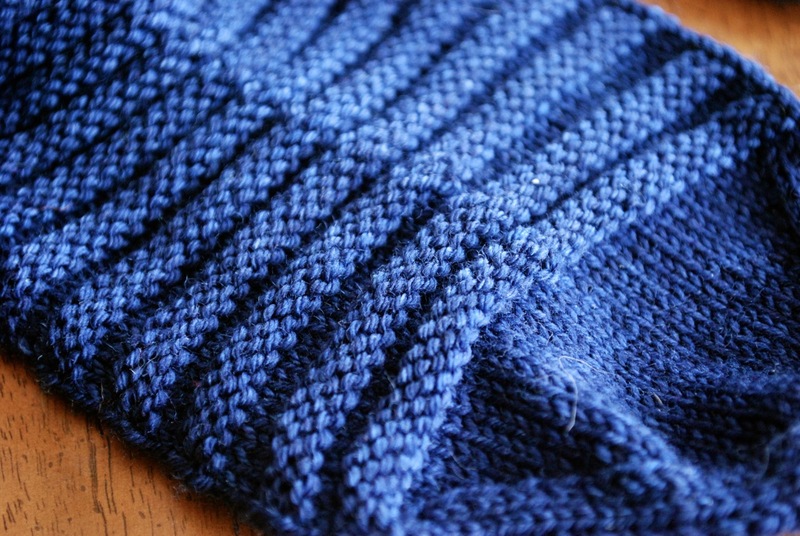 Two hundred stitches and 30 rows of stockinette with strategically placed decreases and increases in the middle. 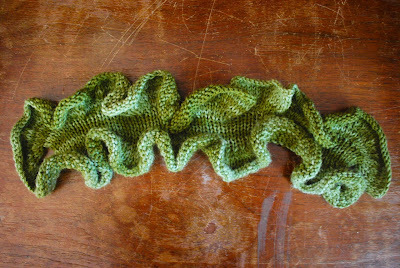 A ribbon of ruffles. A keyhole is the finishing touch. 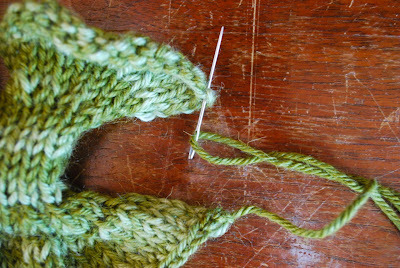 The cast off tail is joined to the first cast on stitch. Like my friend I'm sure I'll have to make more than one. A bright, colorful ruffle makes a fun accessory. The yarn is an Alpaca / Merino / Silk blend I have available only at shows. DanDoh will make a nice addition to the project options for this yarn. 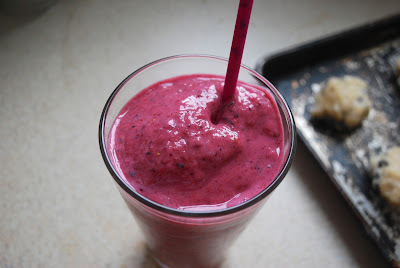 I think of berries only in the summer, but my daughter had a craving and came up with this berry treat. My color inspiration for the week. When my kids were little and their birthdays rolled around, they would spend a considerable amount of time choosing birthday cakes. They would pore over cookbooks and ponder various fancy-pants cakes. The cakes always look so perfect in the pictures - festive and fun with tiny frosting details. I always told the kids I would make any cake they wanted, but I warned them it probably wouldn't look like the picture. I'm very capable when it comes to baking, but cake presentation is not my thing. I can spend hours with a tangled skein of yarn, but I don't have patience for frivolous frosting with sculpting and layers. The kids have plenty of stories about cakes that were structurally unsound and didn't bear any resemblance to the picture in the cookbook. 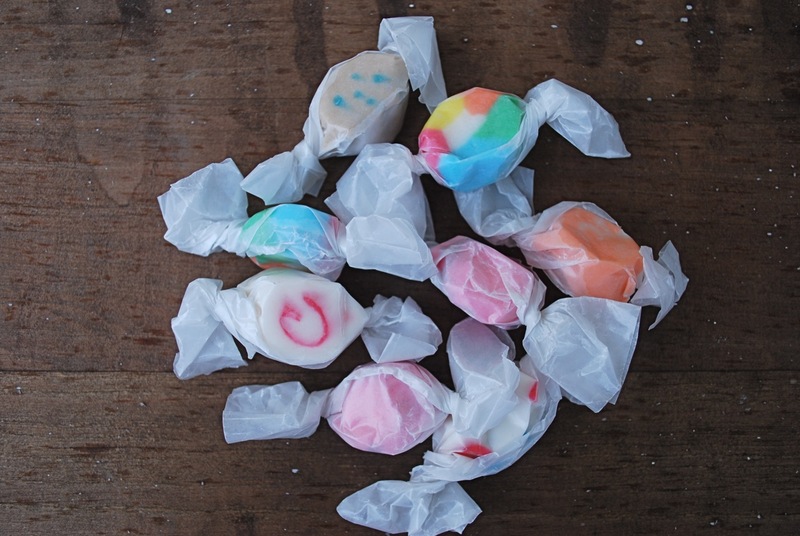 But in the end they all tasted great, and that's the most important part. Knitting can be a lot like birthday cakes. The picture always looks smashing - from the model to the color to the lighting to the setting. Picture perfect. 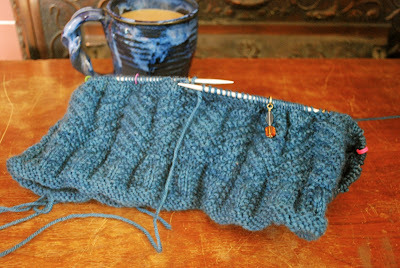 Then I start knitting the project and find that I have to adjust my standard of perfection. The color isn't quite what I thought it would be. The sleeves are longer than I thought they would be. (I have short arms, and they're not going to grow. I should have mastered this one by now.) My buttonholes came out bigger. You get the picture. When I started my Treppenviertel sock project, I was reminded of my kids and the birthday cakes. I told myself I would go ahead with it, but I didn't expect it to look like the picture. Looks aren't everything and as long as it fits, that's the most important part. I'm working with a misfit skein of yarn that has some funky color that made its way down the leg and then cleared up in time for the foot. I'm considering that a design feature. Other than that I finished my first sock, and I'm pleasantly surprised. It looks like the picture. And it fits. We're still in the thick of winter, and the howling wind is a good excuse to wear a couple more layers of wool. 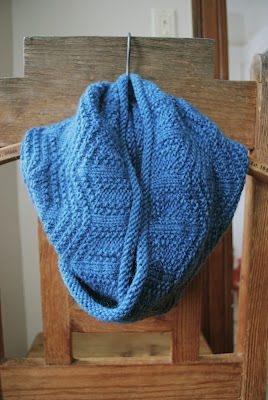 The other day I cast off this cozy cowl. 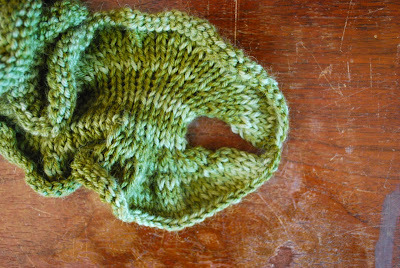 This was a surprisingly quick knit. I was mesmerized by the emerging design - combinations of knit and purl create a fabric with rich texture. 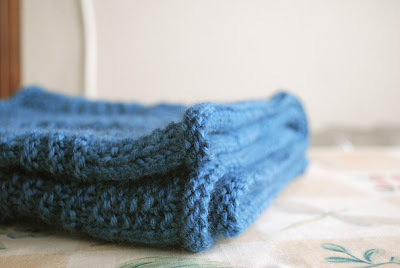 This cowl comes in two sizes, and I made the larger one. 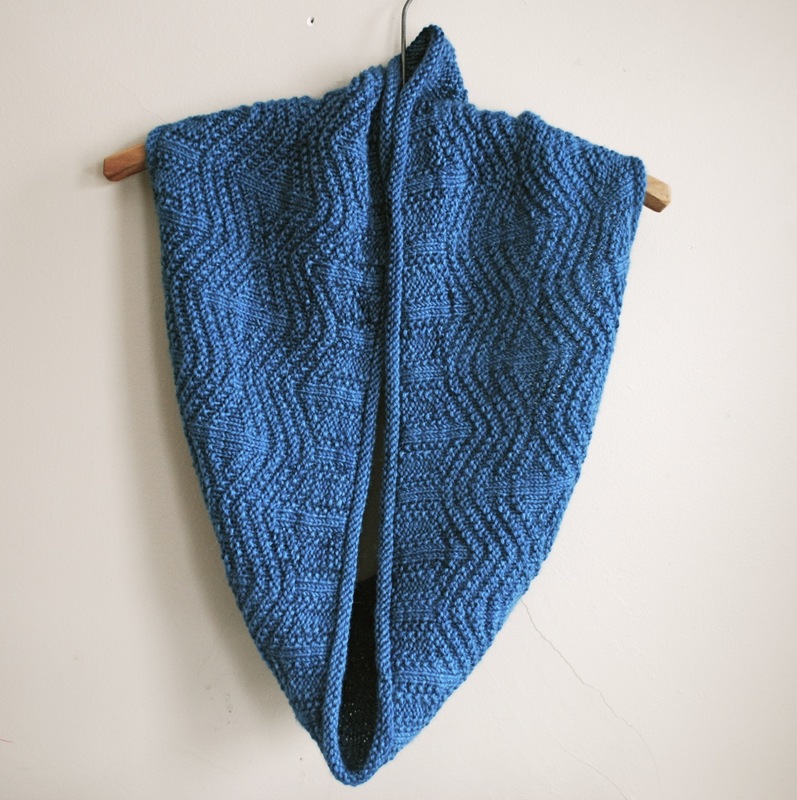 The well-written pattern includes both written and charted instructions with an optional rolled, stockinette edge. I opted for the roll. The yarn is Dirty Water DyeWorks Clara, colorway Blue Me Away. 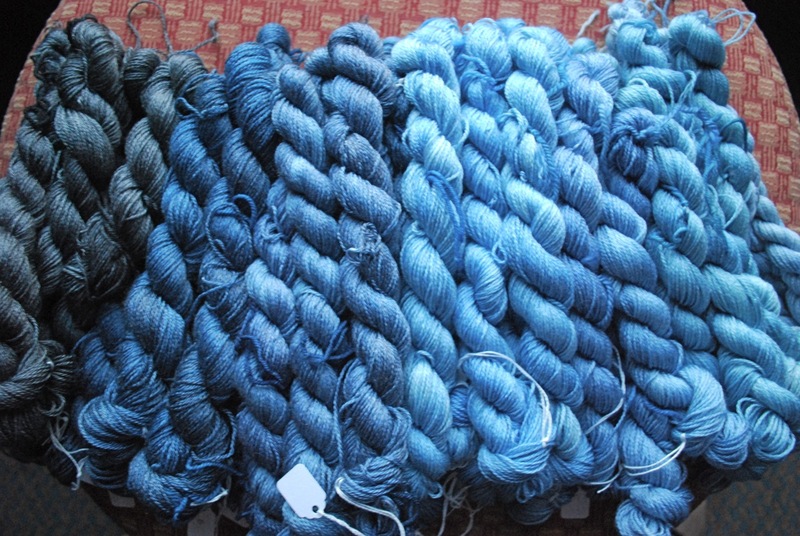 Clara comes in large, 250 gram skeins. I had made my Winter Trails hat from this colorway and used the leftovers for Dovetail. 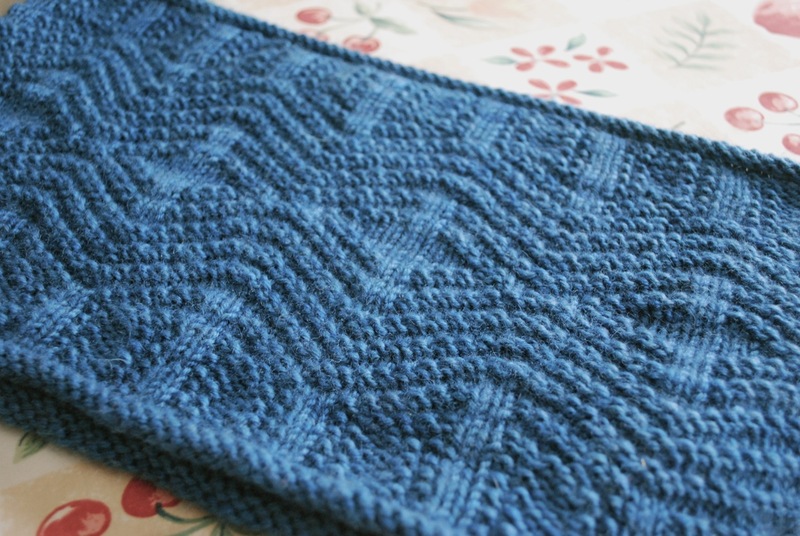 These two projects were a good combination for one skein of Clara. Between the two I used almost the entire skein. 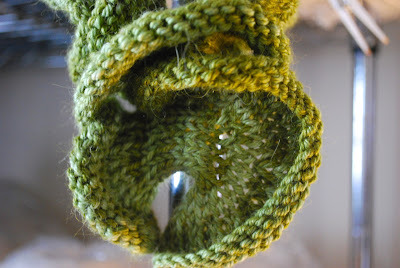 With sixteen grams left there was just enough cushion that I didn't panic about running out of yarn. And now I'm off to shift gears . . . planning spring colorways and samples as I eye more snow in the forecast. Dovetail is on its final rounds, so the other day I was trying to decide on a new knitting project. This is one of my favorite tasks, but sometimes the job can be overwhelming. 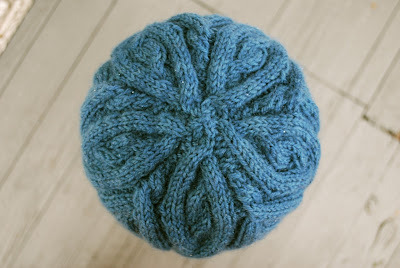 I start looking at patterns and want to cast on everything from a baby hat to a man's sweater. But this time I was focused. It had to be small, and I was in the mood for a sock. Half the work was already done for me. 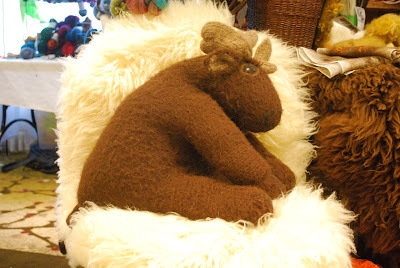 Then I started looking for yarn and stumbled across this. 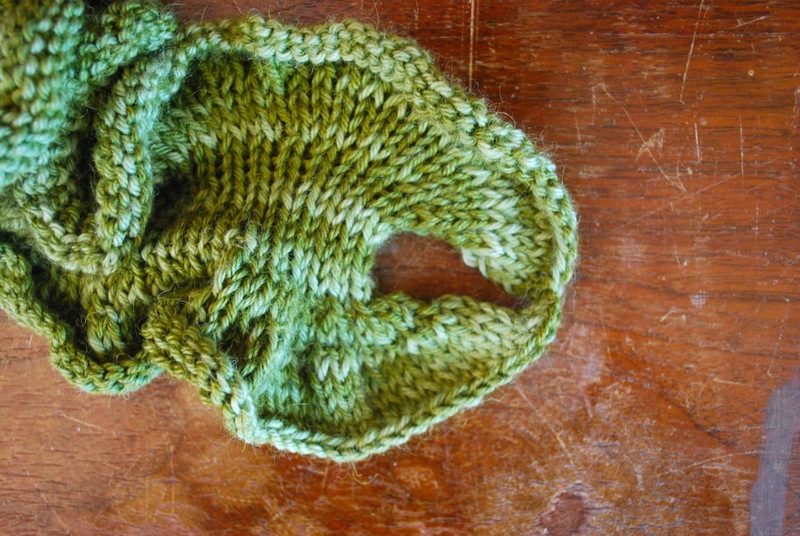 An orphan skein. Last fall in the midst of a dyeing whirlwind this skein came out of one of the dye pots - a misfit from the mill. There was nothing wrong with the yarn, but the barber pole meant that I couldn't sell it with my regular inventory. I tucked it away for later. Of course I forgot all about it, but when I uncovered it in my sock yarn search, I decided I would use it. It doesn't really matter if my socks are a little wonky. 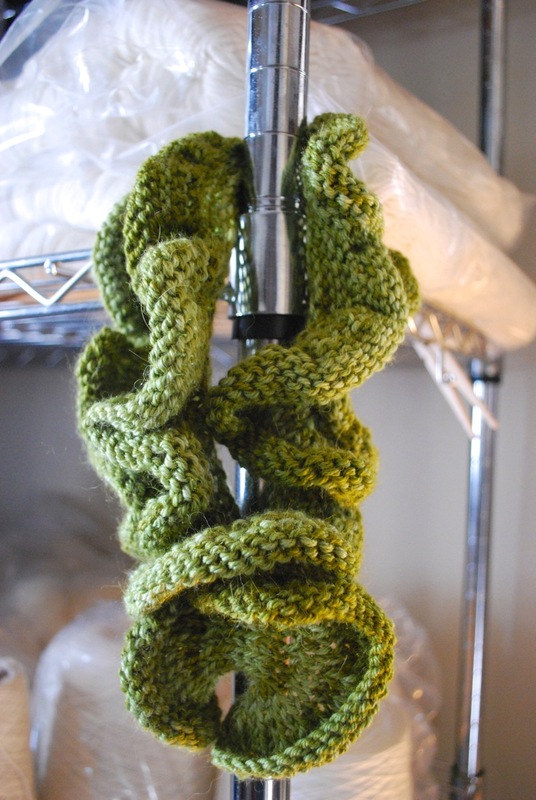 I was hoping the barber pole section would be somewhere in the middle of the skein. That would make it more likely that some of the crazy would be in both socks. 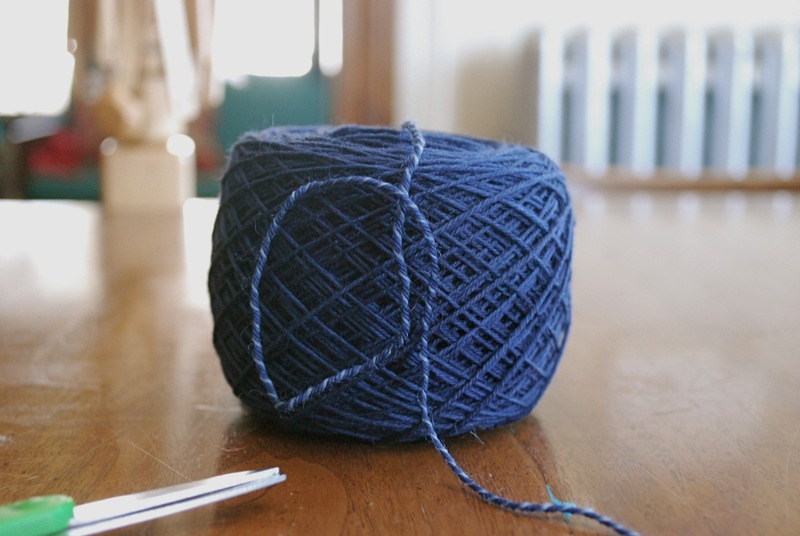 But when I wound the skein, I found that it was just on one end. 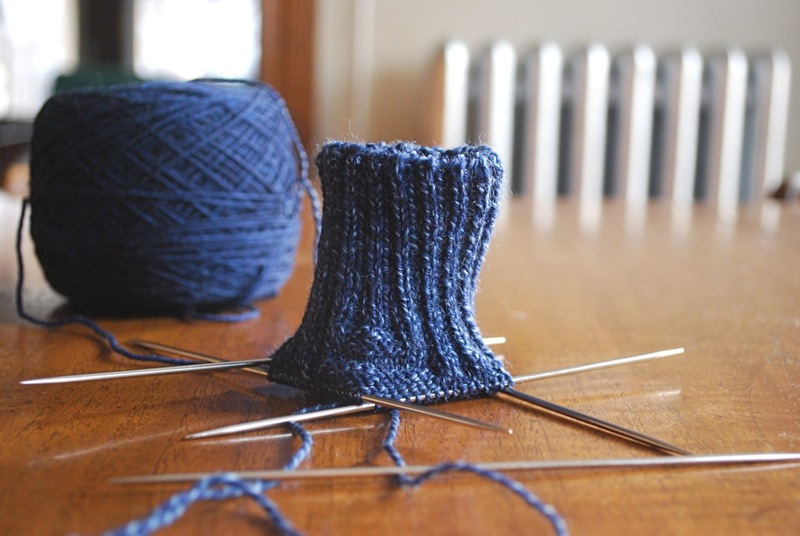 I don't want to mix and match this skein, so these socks are destined to be fraternal. I still have quite a bit of barber pole yarn to knit. I'm curious to see how far down the leg it will go. Treppenviertel. Ribbing with a twist. 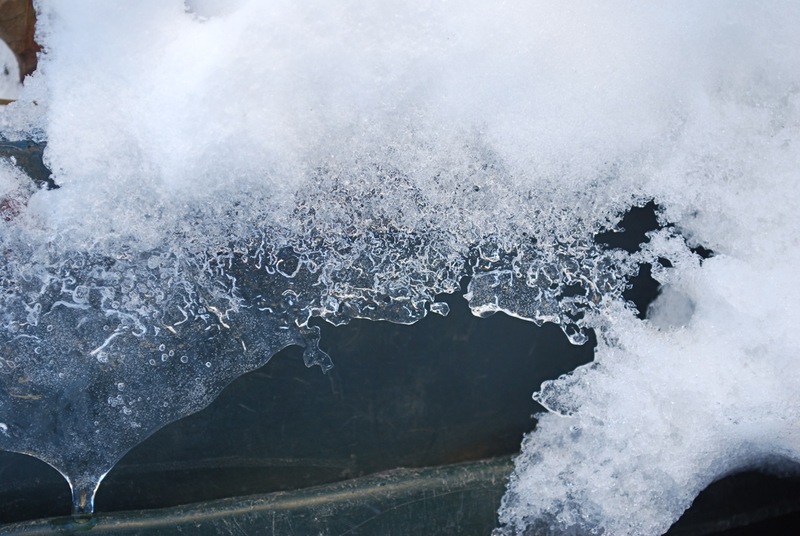 My color inspiration this week comes from the world of snow and ice. Winter is my time for catching up, plotting and planning. There are the fun tasks - testing new yarn bases, dyeing new colorways, knitting new samples. And there are the not-much-fun tasks - sorting paperwork, scheduling, updating the website. 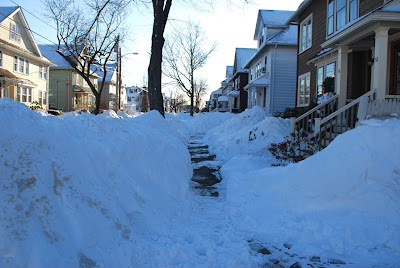 It's the middle of February, and I'm scurrying to catch up on my winter tasks. Now that my winter shows are finished, I can settle down and concentrate on all of the above. My system for getting everything done involves balancing the fun with the not-much-fun. 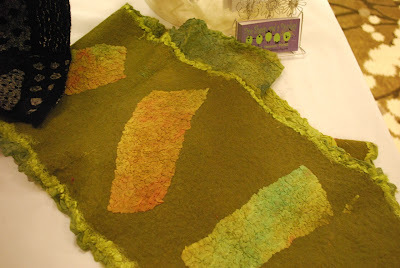 I'll work on the website or attack a pile of papers and follow it up with dyeing experiments or knitting time. 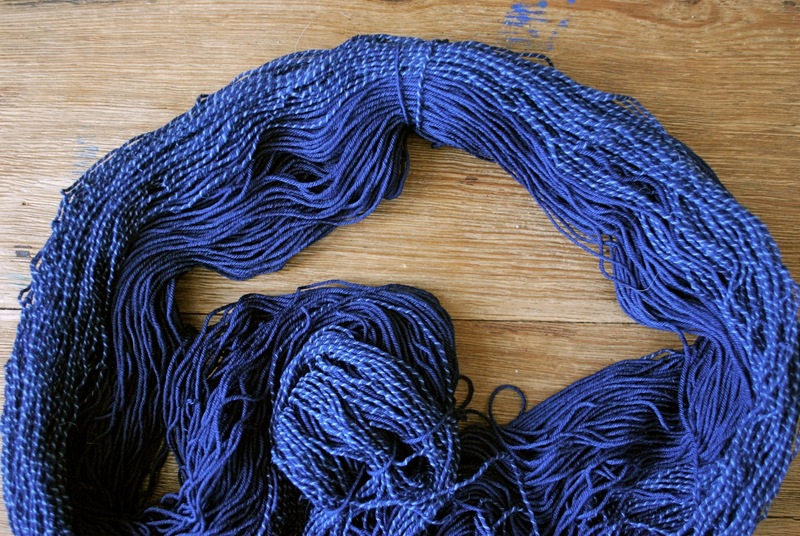 The other day I updated the website with a new page - Special Skeins. This section has a rotating collection of one-of-a-kind and limited run colorways. 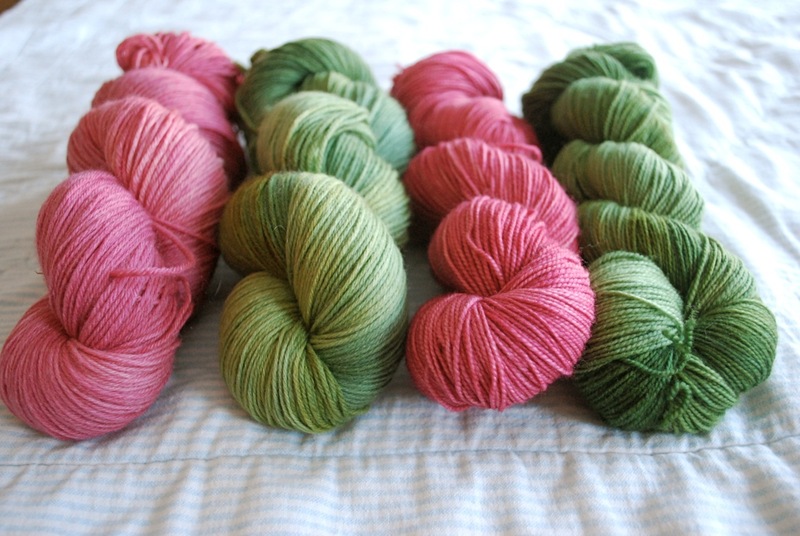 The current listing includes colorways from the SPA Knit and Spin weekend. I'll be posting regular updates, so check back often. To balance the website update . . . knitting time. The cowl keeps growing. In case you're wondering, it's Dovetail. 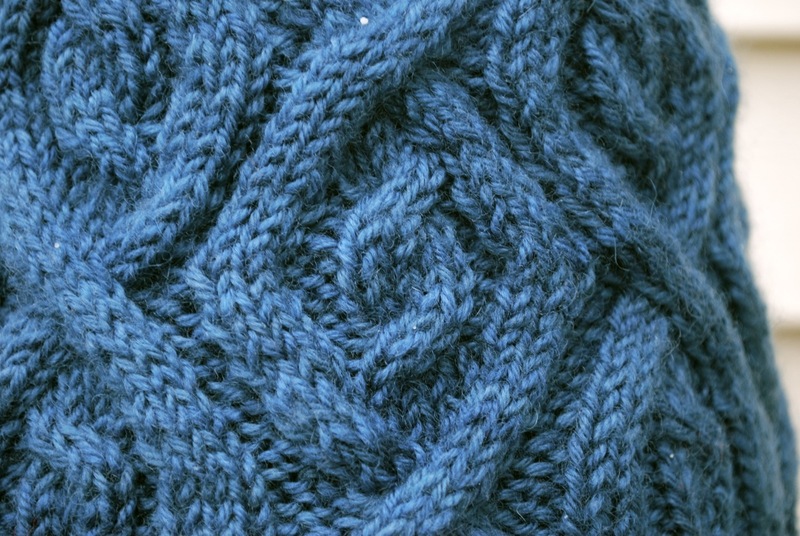 Different combinations of knit and purl create a textured pattern. I'm easily entertained. The storm that rolled in over the weekend didn't come without plenty of warning. People were preparing for days. By Thursday grocery store parking lots were full of chaos, and the bread shelves were empty. 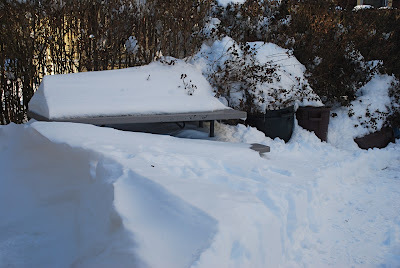 Mother Nature delivered as planned with over two feet of snow. Blizzard force winds added to the event by creating impressive drifts. Digging out and cleanup continues today. Many area schools are taking another snow day. I would have been disappointed if this storm had fizzled. 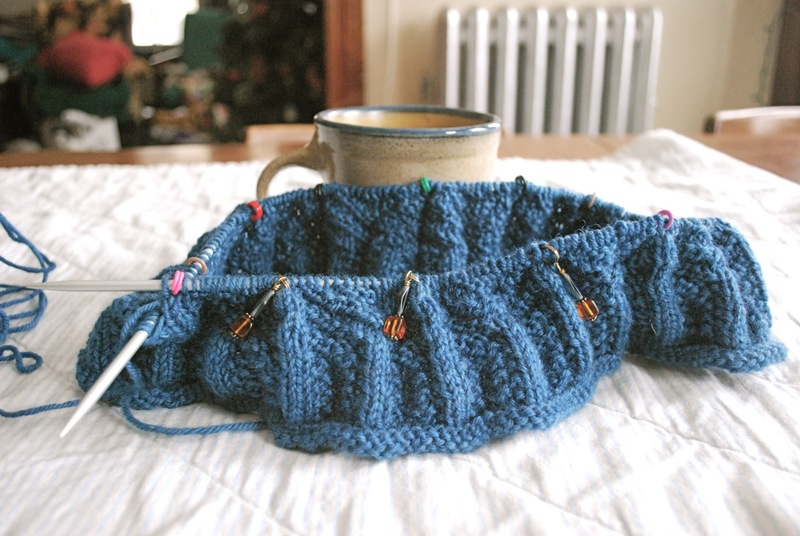 A major snowstorm is cause for celebrating all things cozy with plenty of coffee, knitting and cookies. Being snowed in gives me hope that I'll catch up on work at my desk. 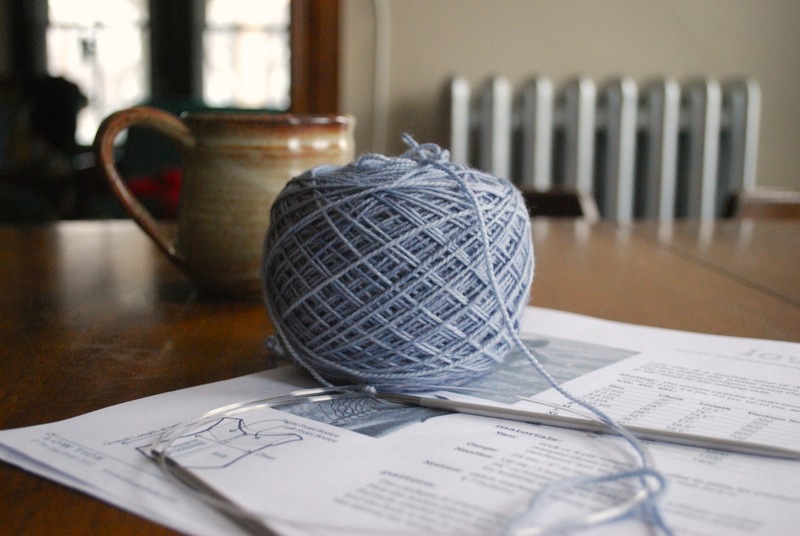 Being snowed in always includes plans for extended hours of knitting. As I assess the damage this morning, there's still a backlog of emails, and the mountain of paperwork hasn't budged much. But I did spend time with my knitting, and there's a new cowl under construction. Every once in a while my timing is spot on. There's nothing like a new hat for fresh snow. Winter Trails. We have a major winter storm bearing down on us, and this pattern seems appropriate for the occasion. Winter Trails is full of dense, cushy cables creating a fabric loaded with texture. This hat has plenty of give and can accommodate a variety of head sizes and shapes. The yarn is Dirty Water DyeWorks Clara, colorway Blue Me Away. Clara is a worsted weight, 100% Blue Faced Leicester yarn - soft and cozy. This yarn comes in large, 250 gram skeins. Winter Trails made only a dent in the skein, so I'm contemplating how I'll use the leftovers. A new cowl sounds good right about now . . . This week I found my color inspiration in salt water taffy. The weather has been cold, and one of my favorite hats has gone missing. I don't usually panic when something is missing. Most missing objects surface eventually. But this hat has been missing for several weeks now, and I can't recall when I last saw it. 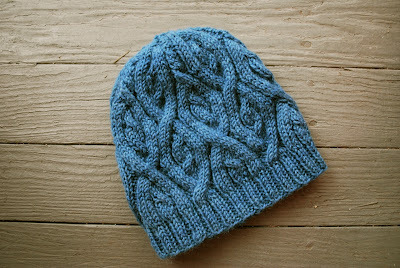 Yesterday I decided to speed up the recovery process by knitting a new hat. 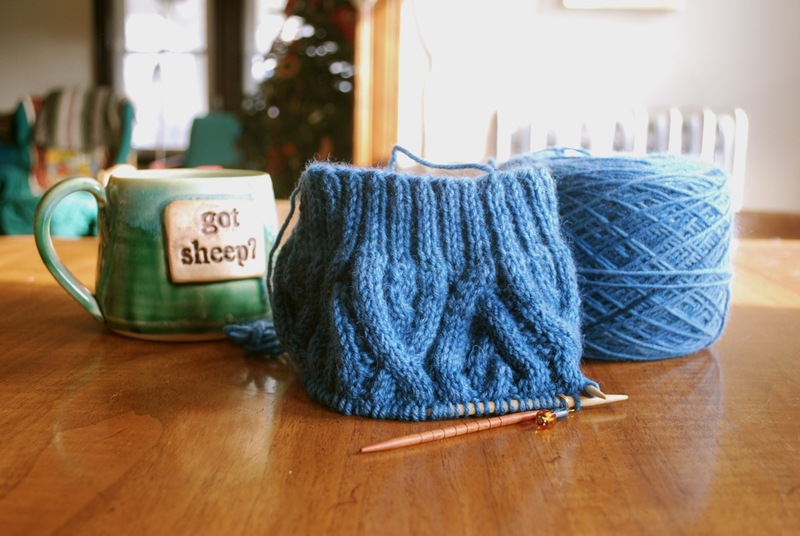 My theory is that surely the missing hat would make an appearance once I had a replacement on the needles. So far the magic hasn't worked. That's OK. I really like this new hat. It just might be my new favorite. The SPA Weekend has come and gone. Time moves so quickly at these events, but I try to savor the moment. Attendees wore their knitwear all weekend - a colorful parade full of ideas and inspiration. I caught sight of a couple of yarn bombing attacks around the hotel and everywhere there were knitters and spinners hanging out, doing their thing, enjoying each other's company. Since I've been gone for four days, I need to assess the damage on the home front. I have a feeling that dirty laundry is at the top of the list. 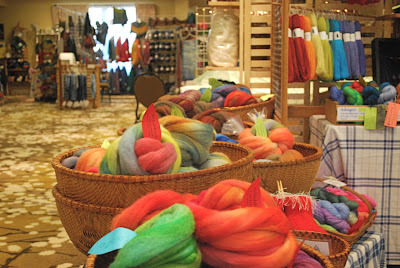 My post today is a glimpse into the marketplace - a wonderfully diverse collection of fiber-related goodies. Colorful fiber from Linda at Pinestar Studio. 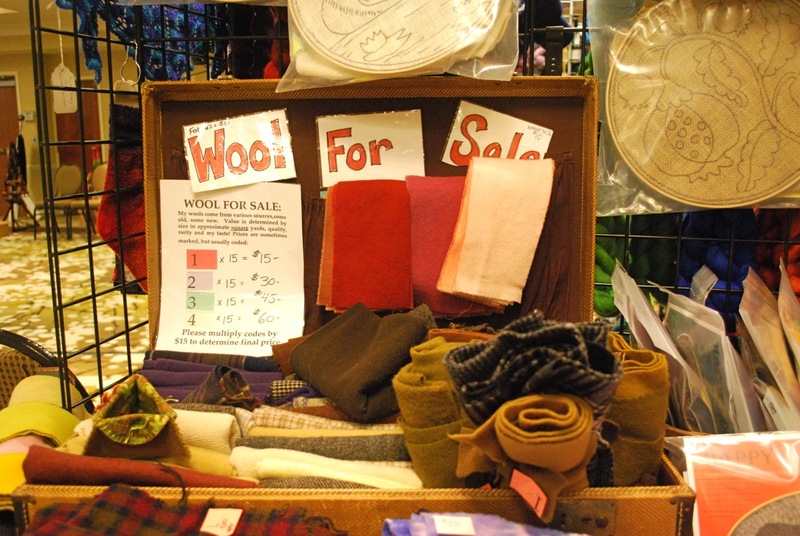 A selection of wool and all things rug hooking from J. Connor Hooked Rugs. 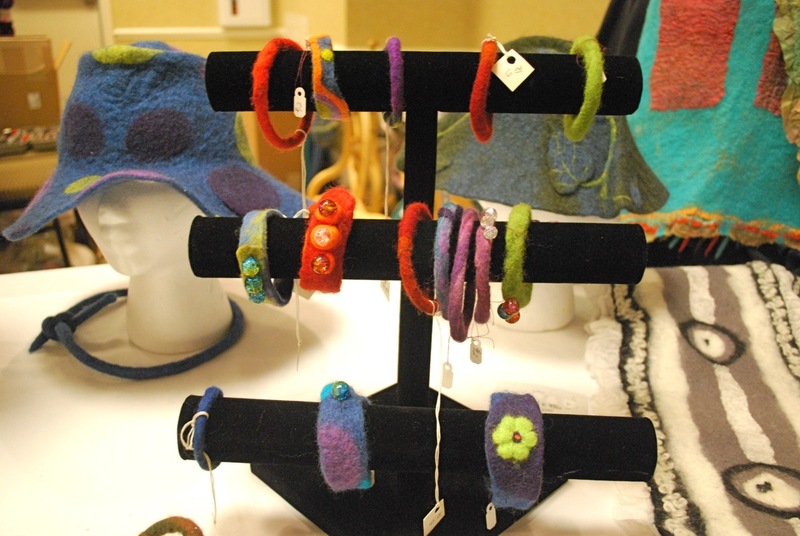 Assorted felted items from Five Sheep and a Donkey. 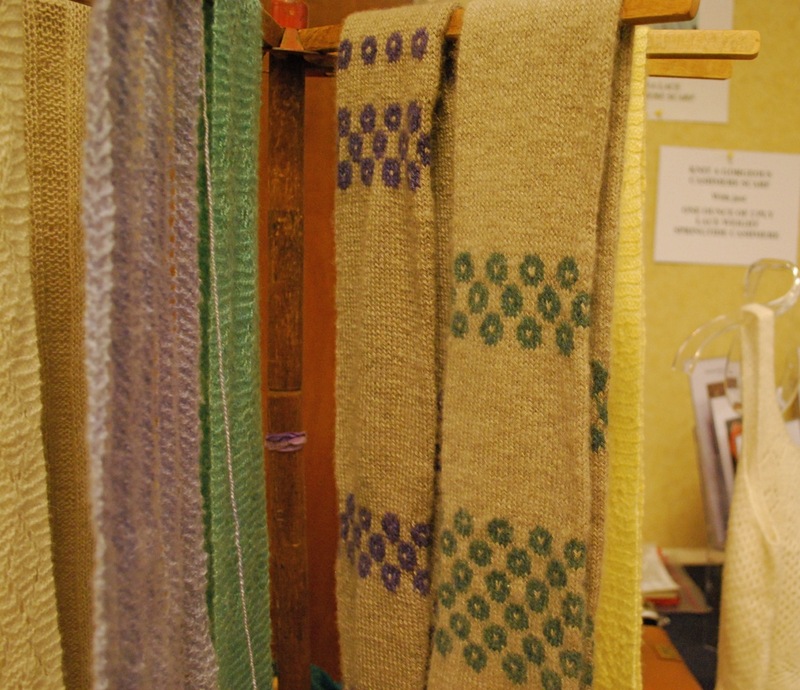 Scrumptious cashmere from Springtide Cashmere. A huggable moose from Mountain Fiber Folk. And an adorable creature from Good Karma Farm. I think it's safe to say that a good time was had by all. I'll carry those good thoughts with me today as I tackle that mountain of dirty clothes. Today I'm blogging from the road. Yesterday I made my escape to Freeport after a chaotic couple of days in which I threw a birthday celebration, dyed last minute skeins, labeled yarn and thoroughly trashed the house. I abandoned the homestead without even attempting to tidy and instead left the kids with instructions to clean the kitchen and wash a load of towels before my sister-in-law arrives this weekend. They'll get extra points for vacuuming. To say that yesterday was windy would have been an understatement. For the whole trip I had both hands on the wheel in a white-knuckle grip. The random, intense gusts were waiting to catch me off guard and toss me into the next lane. I felt like I was trying to keep a bucking bronco on course. When I arrived, the hotel lobby was already packed with knitters and spinners. It was like stepping into another world. I touched base with a couple of friends and then had some time to unwind. And do some sorting. I don't usually roll into an event the day before, so it's been nice to catch my breath. In my rush to get on the road I didn't allow myself enough time to thoroughly contemplate my travel knitting. I left the house with a sock in progress. That's it. I had a moment of panic as I closed the suitcase and thought of grabbing more yarn - any yarn. 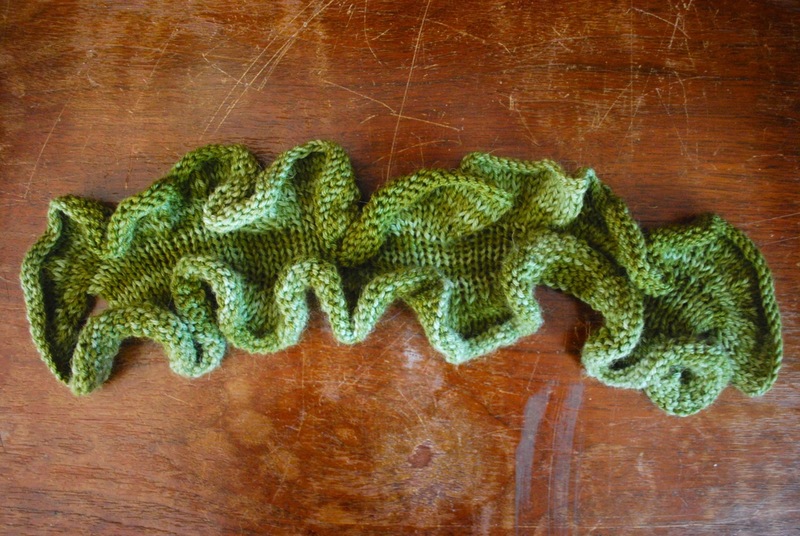 I know I won't have much time for knitting, but it's fun to pretend. Today the real work begins . . . booth set-up. My color inspiration this week comes from Slater Mill where there's a machine on display with gears, bobbins and thread guides. 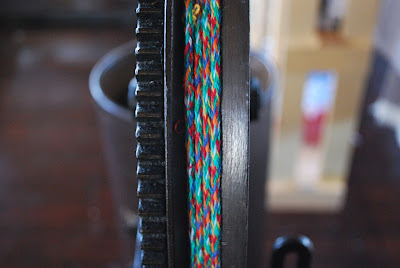 It takes several strands of thread and weaves them all together into a cord. Kind of like an I-cord with many colors.